Successfully Added Fingerprint Door Lock Sleek (Right) to your Shopping Cart. Sleek Fingerprint Door Lock for the latest in business security and safety. A heavy gauge, all-metal door entry protection biometric door lock for use when only the highest quality security system is acceptable. If you need the presidential level protection and won't settle for anything else, look to the CVPW-J30 Fingerprint Door Lock. 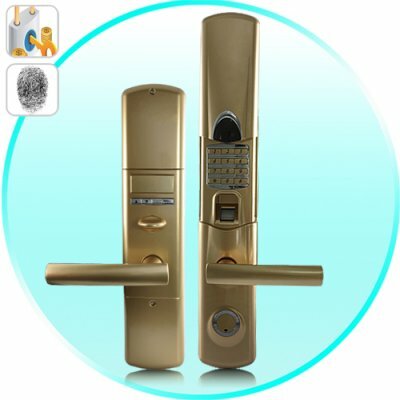 Heavy Duty: The tremendous size of the fingerprint door lock only symbolizes the amount of responsibility it can handle. The CVPW-J30 can handle whatever you throw at it and was meant to guard the most important locations, like banks, VIP rooms, and safehouses. If someone was not meant to have access, then this heavy duty fingerprint lock will make sure it stays that way. Indestructible: Fireproof, high grade aluminum. Everything that comes with the CVPW-J30 is of the highest quality, so you can sure that from the lock set to the strike plate, you're getting every cent that you paid for. In fact, your building will fall apart before this fingerprint door lock does. Secure: Mortice dead lock with dual latch bolts means heavy duty, high level security. Throw in a fingerprint scan requirement and you have the most impregnable fingerprint system known to man. This Fingerprint Door Lock is impossible to break into, but for those who have clearance, access is easy and only takes a few seconds. Easy: Simple installation and an easily fitted unit means hours saved and minutes away from total protection. Along with a user manual that provides clear and concise instructions that covers a wide range of subjects, from DIY (do-it-yourself) installation to registering fingerprints to lock maintenance, you get maximum protection for minimal effort. In addition, the CVPW-J30 is complete and ready to go, meaning it comes with everything you need for installation - except a door. For total security, convenience and dependability for a lifetime, the CVPW-J30 heavy duty fingerprint door lock is a small price to pay. Built from only the highest grade materials and made for only the highest level of safety, this is the ultimate in security for the 21st century. You can't go wrong with our famous 12 month guarantee and factory-direct price - brought to you by Chinavasion, the leader in China electronics. Order it now and we'll ship it out tomorrow! It is weatherproof, meaning it can withstand harsh weather conditions like wind, fog, mist, etc. However, this biometric security lock should only be installed in sheltered areas where it will not have any direct contact with rain, hail, or snow.